Conundrum Aftermath: Where Do WE Fans Go From Here? 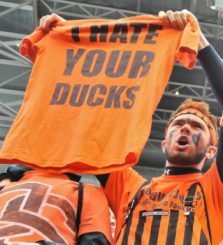 Last Monday felt like the earth moving in Oregon, as my article sent shock waves among Ducks fans on both sides of the conundrum. My objective was to declare my thoughts about what I was seeing, and it gave permission for others to voice their concerns about the future of the team as well. We had spirited debate all last week about state of Oregon football, and many who disagree with me feel that patience and new talent from the extraordinary recruiting will lead to results in the years ahead. That article (and others before and after) on this site have opened up the same debate in other circles. On other sites, the name FishDuck is now a pejorative term — associated with an unbeliever who is disloyal and truly clueless or who has no patience for the building process of a football team. I am not playing the victim card, as after publishing over 400 articles, I am a big boy who understands the publishing game and consequences of my opinions. I knew going in what the reaction would be, and it is what made me pause as long as I did before sharing my thoughts. Can a “Conundrum Fan” cheer for two things at once? For those of us who like so many aspects of the Mario Cristobal era (such as the culture, the honesty and the recruiting), it is also very hard to watch some of the errors in coaching we currently see with our beloved Ducks, which were not present in the majority of years under Mike Bellotti and Chip Kelly. So what do the “Conundrum Fans” do now? Where do we go from here? How do we support the Ducks, how is this site going to operate and what editorial direction will this site sway to? As a loyal fan on either side — how are you going to navigate this new landscape with the myriad of opinions about our Beloved Ducks? First of all, you need to know that we do not have a bulletin board outlining to writers what their subjects will be each week. They stun me with what they publish, just as they do you … I was very surprised to see other writers on FishDuck.com bring up the regression of the defense, the regression of quarterbacking and the possibility of regressing as a team, just as I have noted the regression of the offense. However, when the FD.com writers later come out with articles in defense of Coach Cristobal, I will have had the very same “no-impact” policy on their topics. We will not have an editorial direction on this site, and I will let the writers cover whatever topic moves them, while we can all offer our views in the comments. It is going to seem awkward at times … as I will give credit where due, and cover superb plays when they happen, even though that will almost appear weird considering what I have written recently. But football, like life, is not one way — good or bad. You have to remember that those of us in this conundrum want the staff to do well, and love so much of what we see. But we are not going to ignore the issues that are obvious and disconcerting, so we will balance out the support that so many of you show in the comments below the articles. I am going to be referring back to this article in the future as the one that has the concerns of “Conundrum Fans,” with links to other articles and that secures the date all of this was written. — An offense that bunches players in tight formations, and thus is easier to defend. Points are way down from the old offense. Averaging 29 points per game in Pac-12 play is not enough and would be lower if not for the defensive touchdowns and short fields created by the defense. — We were told by Justin Hopkins of ScoopDuck.com just four days before the Utah game, “the sooner you realize the Chip Kelly offense is long gone and Oregon’s will look more like Bama (to a degree), the happier you’ll be.” Yet, in the Utah game we saw a tiny re-emergence, a spark in the running game brought about by reintroducing the Outside Zone Read made famous by prior coaches. 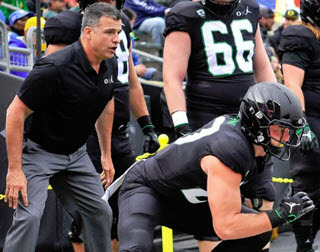 Cristobal and his under-performing Offensive line. — Offensive line play that is lacking, with significant under-performance coming from experienced players. — Receivers that as a group have stagnated, showing much less improvement than usual in year two. — A Quarterback who has regressed over several games, with glaring mechanical issues that have gone uncorrected. 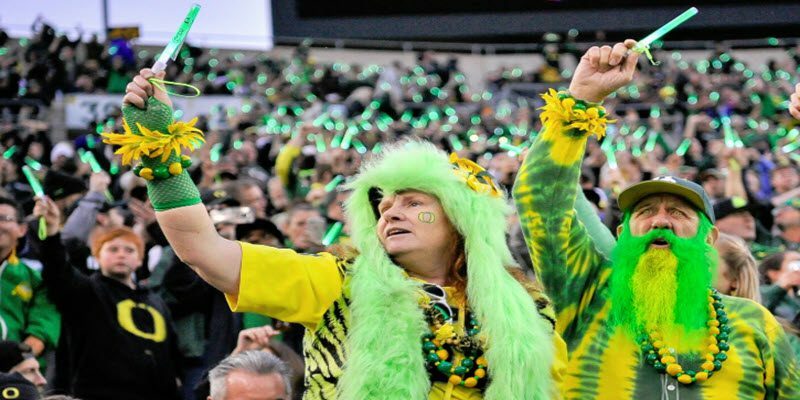 —A predictable offense with a lack of flair, an absence of a “system” and without an identity that the fans can relate to, which conflicts with the Oregon brand. — With the defensive backfield training through two springs, two fall camps and into the ninth game (UCLA) of the second year, should coverage busts that result in two touchdowns be happening at that time? — The defensive line and OLBs are experienced and talented, and yet often do not set the edge. 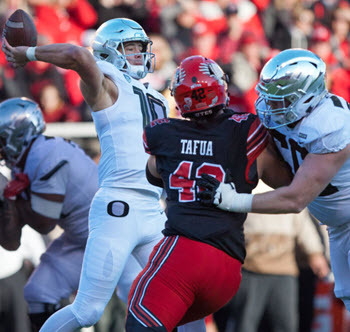 — The concept of wearing down the opponent is actually happening to Oregon, as the Duck defense gives up big gains in the fourth quarter, beginning with the first Pac-12 game against Stanford. Utah got TWELVE tackles for losses against the Oregon offensive line? — The coaching staff is not preparing players well for road games, and is often unable to react to opposing teams playing with emotion. — My assertion from a month ago that “this staff is long on recruiting skills, and short on coaching expertise” is becoming painfully obvious to all. — There is not enough time for these coaches to learn everything the hard way through experience, as the fans are paying the price for their learning curve. There is more, and those are covered in other articles linked, but the conclusion many of us have reached is that this team will be successful with the recruiting, and will win a lot of games, but this is not a staff that will win a National Championship or turn Oregon into an elite program again. The only way that can happen is with massive changes to the coaching staff and with major philosophical changes in how the offense is run. Can that happen? How to be a “Conundrum” Fan? It shouldn’t be hard, but it is. 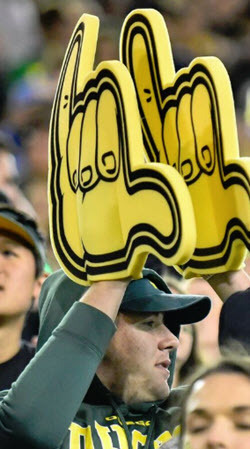 You want to be loyal and believe, but you cannot have confidence in Oregon returning as a nationally relevant team based on what you are seeing. My friends … I am going to be tip-toeing through this emotional morass as you will be. My prosaic way of dealing with it is simply being true to what I see; good plays and strategies need to be called as such, and poor ones should not be ignored. This site will not be an “Anti-Cristobal” site (certainly not with all the wonderful things published here about him and the staff! ), but it will not be a “Cristobal Boot-Licker” site either. We have a number of astute readers who disagree with me and other “Conundrum Fans” who really make a great case in the comments. They will provide balance to our views and keep us all on an even-keel. Note how I am now calling this group of us “Conundrum Fans” as it certainly describes our plight. I cannot state enough how special the comments are below the articles, as it is the most civilized Oregon discussion out there, and it is carefully monitored and guaranteed to be “TROLL-FREE” unlike anywhere else. There is no downside to commenting, and I encourage everyone to state their views under the articles published six days each week. Readers — do us all a favor. Send the link of this site to your rational Oregon friends, post this link on Social Media — all of sites you are a part of — and let everyone know we are the only safe Oregon football website out there. I formally announced my concerns last week and wanted to crystallize all the links and points together for future reference. It is easy after-the-fact for others to paint us into a corner claiming they know our views; our perspectives are in the articles linked above and in the comments under them. For those visiting the site for the first time — we want everyone’s comments below, but do know we are strict with our rules. We are the only Oregon site that insists upon civilized discussion; state your case as we welcome all opinions and discussions, but we must be polite to each other.